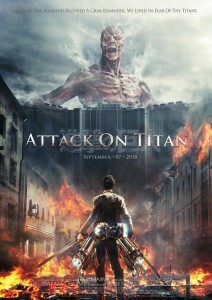 Attack on Titan Anime Series Poster. Attack on titan is a new Anime series developed by Hajime Isayama who developed the series as a one shot Manga and then when he moved to Tokyo to develop the series more became a full blown popular series with an Anime adaptation. The series focuses on a world where humans have had to live in multiple colonies which have been divided by social classes, each one protected by a large wall. The wall has been developed to protect each city from Titans, large giant humans with no genitalia whose only sole purpose is destruction and eating people. They are mindless giants who only have one goal which is to wipe and extinguish out the human race. Three friends who have been together since childhood Erin Yeager, his adopted sister Mikasa Ackerman, and friend Armin Artlet all witness the death of their families and destruction of thier home town join a special forces unit to take out Titans. This is a story of their lives in the defense force as well as the scout recon units. each one of them vow revenge for the death that titans have caused and using a 3D movement system they are able to fight with the giants in heavy battles but it is very clear that this war is very one sided and the titans are winning. This anime series captures a very dark side of war and human nature. there is a very realistic value on each charaters emotions on how they deal with each situation one by one. this series is defiantly not for the weak hearted as death and survival become a very heavy reality to the series itself.